'True faith' has a slightly rococo feel to it. All the trademark New Order elements are there - synthesized percussion, a twangy guitar lead that demonstrates New Order's affinity to Cure, chord progression keyboard parts, and Bernard Sumner's somnambulant vocals making vaguely ominous pronouncements - but in a more elaborate, fuller sound than before. The song looks forward to the New Order of the future on Technique and Republic. '1963' has all those elements, too (minus the vaguely ominous pronouncements), but more sparsely, and it looks back instead of forward, feeling like a platonic New Order song that would have been at home on Brotherhood or Power, Corruption & Lies. It could easily make a top five list of songs that epitomize the aesthetic of New Order's early era. Its biggest distinction from the early hits is its much more complex chord progression. To appreciate '1963' it makes sense to position it as the companion piece to 'Love vigilantes' (the first track off of Low Life) with them regarding each other as halves of a diptych. They are two of the very few New Order songs that contain a full narrative, rather than the vignettes and symbolist imagery Bernard Sumner favors. 'Love vigilantes' tells the story of a soldier who is finally granted leave and rushes home to his family, only realizing that he has died when his spirit reads the telegram in his overwrought wife's hand. '1963' tells an opposite but complementary story. This song is sung from the point of view of the wife, instead of the husband. And this time, the man does return home, but he kills his wife, who loves him desperately to the very end, and longer. While '1963' doesn't explicitly identify the man as a veteran, I think it's inferable from the title (a year of escalation in the Vietnam War), the allusion in the second line to 'When Johnny comes marching home', and the suggestion of post-traumatic stress disorder. The lyrics use a few devices to heighten the impact of this tragedy. The first verse is quite loving, which makes the sudden turn in the bridge unexpected, and the chorus is a complete reversal. The second verse twists the knife further by mentioning the man's second marriage, showing that this victim's soul has persisted, loving and witnessing long after her murder. Her memory shifts; the tears she saw in her husband's eyes when he shot her are now remembered as hatred, but that doesn't diminish her feeling in the least. 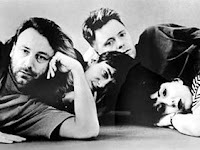 New Order is not particularly known for their b-sides, but '1963' is unique because of its success both as a quintessential New Order song and as an unexpectedly moving story. This group has regularly defied expectations over the course of their career, and this instance is one of my favorites.